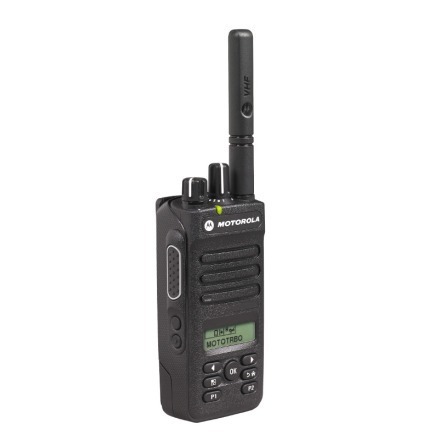 Motorola MOTOTRBO™ DP2600 Two-way Radio - ConnecTel, Inc.
How do you keep employees connected and safe while monitoring supply needs on a manufacturing line or reporting an incident on a construction site? MOTOTRBO™ digital radio solutions can help by putting the power of digital communications within reach. The DP2600 with intelligent Audio and voice announcement features enable easy communication in difficult work environments. Also, it's analogue interoperable, enabling you to make the transition to digital at your own pace, all at a value that adds up. 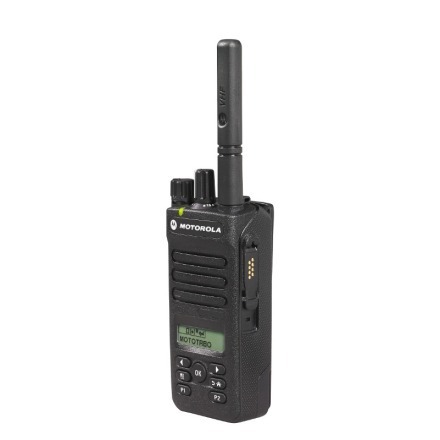 Available in UHF and VHF frequency bands, the DP2600 features a 2-line display and limited keypad for easy menu navigation with 128-channel capacity, four programmable buttons and IP55 specifications for water protection. Equip your team with the DP2600 for best-in-class audio in a scalable solution to your demanding communication needs. When it comes to exceptional audio clarity, the quality of digital can’t be denied. With the DP2000 Series portables, you get digital quality throughout your coverage area plus unique features to help your employees hear and speak clearly, wherever they work. With Intelligent Audio, the radio volume automatically adjusts to compensate for background noise. Now, workers don’t have to adjust their radio volume to avoid missing a call in loud situations or disturbing others when they move into quiet places. Increased background noise suppression filters out unwanted external clamour – from the rumble of forklifts to the buzz of traffic noise. And IMPRES™ audio accessories enhance noise suppression and improve voice intelligibility for smarter audio than they’ve ever experienced before. Because the DP2000 Series uses TDMA digital technology, it delivers twice the calling capacity plus clearer voice communications. When it comes to battery performance, these radios operate up to 40 percent longer between recharges compared to analogue. In fact, the leading-edge IMPRES™ technology in our batteries, chargers and audio accessories also ensures longer talk time and clearer audio. The DP2000 Series offers plenty of features to make workers more efficient. 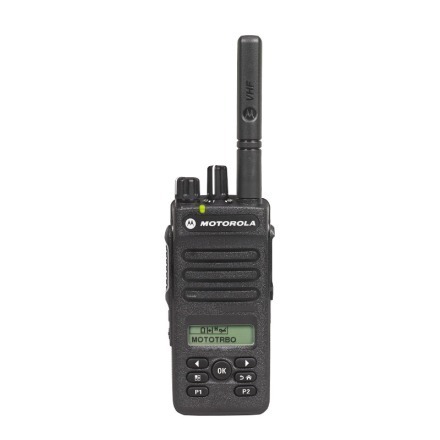 Voice announcement provides audible confirmation so they can be notified of channel and zone changes as well as programmable button features without having to view the radio display. The display and easy to use navigation menu makes the radio intuitive to use so they can stay focused on the job at hand - from the hotel receptionist confirming rooms to security covering a sporting event. Your workforce is hard at work every day – getting drivers home safely, unloading cargo, checking inventory and checking on guests. That’s why you’ll appreciate the easy flexibility and scalability of the DP2000 Series to fit your changing needs and coverage area. All it takes is a simple software upgrade to add key features like enhanced privacy scrambling or the transmit interrupt suite to prioritize critical communication exactly when it’s needed. And when you want expanded coverage or capacity, an upgrade to the DP2000 Series can enable IP Site Connect which dramatically improves customer service and productivity by using the Internet to extend coverage to create a wide area network, enhance single site coverage or link geographically dispersed locations. Or upgrade to Capacity Plus single-site trunking in order to expand capacity to over 1,000 users. Linked Capacity Plus combines the expanded capacity of Capacity Plus with the wide area coverage of IP Site Connect, delivering a high capacity, wide area, and cost effective multi-site trunking solution. So whether you want expanded coverage at a single site or across multiple ones, the DP2000 Series can be scaled to your business and budget. The DP2000 Series meets demanding specs, including IP55 for water protection and U.S. Military Standard 810 C, D, E, F and G. DP2000 Series radios have a two-year Standard Warranty with 1-year warranty for batteries and accessories. In addition, Service from the Start provides multi-year peace of mind with fast repair turnaround times, expert telephone technical support and access to the latest software releases; all backed by Motorola’s globally integrated services infrastructure, highly qualified support technicians and certified repair facilities.